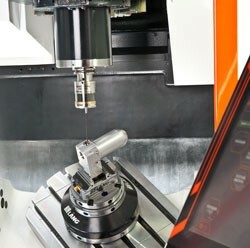 For 2016, Parker Precision made the decision to invest in a new Mazak vari-axis i500 machine, to expand their capabilities and cater for a growing customer demand. Although they had the machinery to produce parts with a multi axis milling requirement, Parker Precision hadn’t got a true 5th axis capability on site, and were having to regret on some customer enquiries as a result. Operational from May 2016, the new Mazak vari-axis i500 machine allows Parker Precision to work with one machine, rather than two, as previously required. This in turn means they have improved productivity, which is hugely beneficial to their customers. It also means they can supply a wider range of customers and have increased their capacity to take on new business. The new machine has also allowed some of the staff at Parker Precision to expand their skillset through extensive training on the new ‘smooth programming’ system.